Many of us I’m sure have sat through a corporate meeting and have identified when someone is playing “politics”. This person’s behaviour is so obvious that it tends to stick out like a sore thumb to the detriment of that individual. The impact of this activity can also alienate them from the rest of the team and significantly lowers the output of the meeting. To resolve and eliminate this sort of negative behaviour, this is where the application of a yet to be invented “politics” calibrated tuning-fork can be applied. Consider the following application in the corporate office. Each meeting room will have a tuning-fork mounted in the centre of the table. The tuning-forks will all have the same business pitch aligned to the corporate values and will resonate in harmony throughout the entire office. 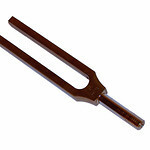 When there is no “politics” being exhibited by those sitting around the table, all tuning forks will be in tune with each other and a constant tone will be achieved. However, should the tuning-fork encounter someone playing the political agenda, the harmonic resonance will be broken and the culprit will be immediately identified by those in the room, and throughout the entire office. Those repeatedly identified by the tuning fork as habitual office politics offenders will have a special entry made in their personnel file. With time, those people who play politics will modify their behaviour as the power of the tuning-fork will ultimately prevail! where do you get this stuff? I love how your mind works! Thanks Liz…..must be the herbal tea!